8 tips for embracing digital design collaboration. Check out Jim Kalbach's workshop, Mapping experiences: From insight to action, at the O'Reilly Design Conference, March 19-22, 2017, in San Francisco. Design is a top priority for companies that want to innovate and continue to improve the customer experiences. While many are investing in design thinking education, the distributed nature of teams makes it difficult for teams to practice, especially together. Ultimately, big initiatives to roll out design thinking as a core competence for all “knowledge and imagination workers” have seen friction for both newly minted design thinkers and experts. Onboarding education formats for design thinking typically rely heavily on accelerated in-person workshops where attendees leave with questions like: “How do I do this with my team that is spread all over the world?” Without a common place to practice what they’ve just learned, distributed teams are forced to either relocate or travel to put the methods to work. After coming together for an in-person workshop, teams experience Workshop Amnesia, as their memory of the training fades while they wait for transcriptions and actionable items. A lack of dedicated project rooms makes it difficult for teams to continuously collaborate throughout a project. A lot of time is wasted aligning which methods should be used in a training session because of varied education levels and a lack of standardization. Rookies need to learn the methods as they go. How does an enterprise nurture a design culture when their teams are distributed...everywhere? The digital workplace transformation has helped bring the global workforce in companies closer together. Video- and chat-based communications have rolled out virally, and teams use them daily for their work. It’s now time for design and innovation workshops, and sprints, to also go digital. Figure 1. MURAL on different devices. Modern teams at global enterprises like Accenture, IBM, Intuit, and Autodesk are already using digital tools and reaping the benefits. Courtesy of MURAL. 1. Expand design studios and innovation centers—virtually. Companies have invested millions in well-equipped innovation centers designed specifically to foster creativity. By incorporating technology, you can remove the physical limits of a room or location and enable innovation to take place everywhere, at any time. Complement in-person workshops with digital tools that allow you to include folks who might not be able to be there. With Zoom or Skype for Business, you can teleport the action and make people seen and heard. And with large touchscreens, you can let everyone contribute and have a first-class seat in all visual collaboration sessions. Pro tip: get the touchscreens on wheels and use them for breakout sessions. 2. Facilitate a digital transformation by streamlining tool provisioning. Teams that bring their own devices need to be supported with pre-selected software tools that help them get their jobs done. If your company can’t upgrade to the latest software in less than 12 months, then why bother with innovation? Teams should be able to get the tools they need ready to go. Quickly evaluate digital tools through a central task force and make them available throughout the company to align teams and enable faster iterating. Complement with education on best practices on how to get started fast. Modern cloud systems are increasingly secure, and those with security certifications like SOC2 make sure the company’s data is protected. As a successful example to follow, IBM, a MURAL client, started a program called Whitewater, which arranged deals for their teams to easily provision collaboration tools GitHub, Slack, and Invision fast and securely. Figure 2. 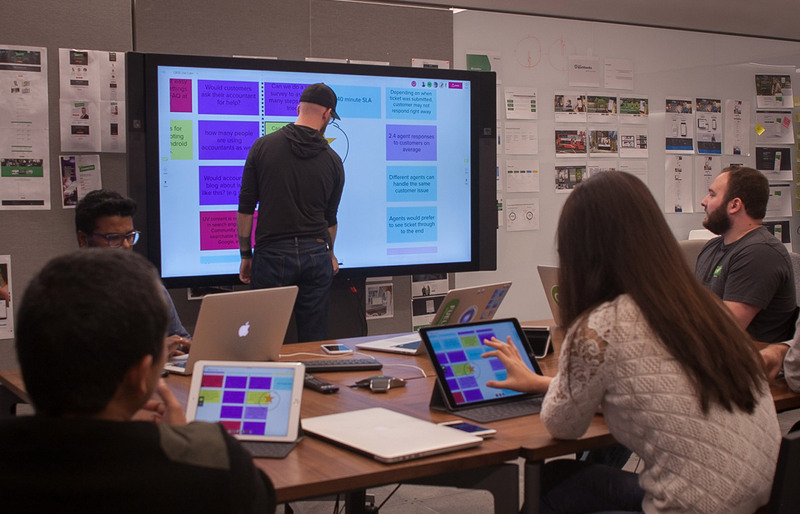 A co-located team collaborates using digital tools at Intuit, as other companies, like Steelcase and Microsoft, are producing creative spaces that simulate in-person collaboration sessions. Courtesy of MURAL. 3. Standardize and distribute methods to onboard teams quickly. It’s important to get the entire organization familiar with standard frameworks or methods. There are a few different ways to do this. People will understand which method to use for each challenge, and everybody will understand the rules of play to get started quickly and not waste time catching up. The LUMA Institute has a method to help standardize and scale design thinking practices as well as deploy “train a trainer” programs for facilitators. Enterprises that need a little more personalization can explore IDEO’s Creative Difference to help understand where they are today, and guide teams toward making the organization more creative, innovative, and adaptive. Online workspaces with predetermined templates, like this Lean UX canvas or Service Blueprinting template, will enable you to embed instructions for executing projects. You’ll save time not having to explain every single framework over and over again. Figure 3. Visual Methods in MURAL. An abstract illustration of some of the typical design thinking visual methods supported in MURAL. Courtesy of MURAL. 4. Use digital tools to make the most of a team’s time together. Global teams generally can only work together for a few hours per day. Make sure you make the most out of these sessions. Use time before the sessions for individual work. Share videos with research and shared workspaces with templates and instructions in advance so people can get ready. Provide instructions to set the technology up and get it out of the way. When live, do a remote ice breaker exercise and make sure you follow your agenda with a timer so people keep focused. Doug Powell, a distinguished designer from IBM even suggests to micro-time-box when working remotely. Alternatively, you can align teams quickly using templates. For example, Erik Flowers from Intuit is leading their global service design team and has designed a template for their service blueprint. They used it to collaborate with their call center staff in the Philippines and sync up on the customer touch points across the whole experience with the company. 5. 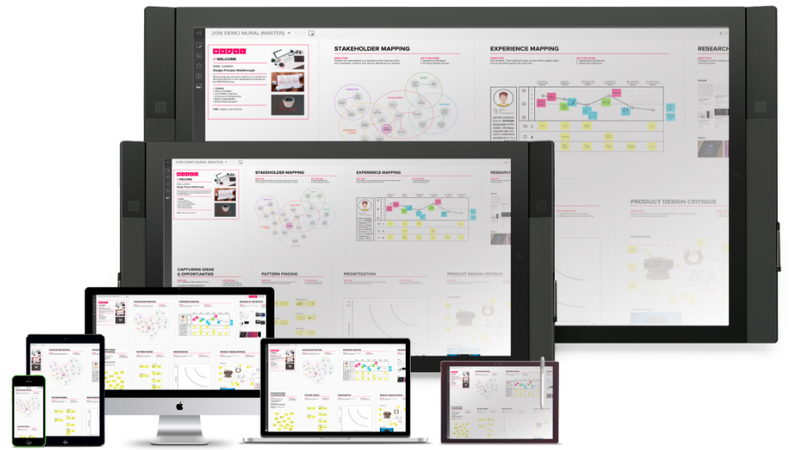 Digitize your workspaces to keep project iterations going. Not all great ideas happen during the work day, and team members aren’t always in the same time zone. Instead of using whiteboards or foam boards with sticky notes that can only be shared by a photo or transcription, digitize the canvas and give teams a consistent place to collaborate. Permanent and persistent spaces like murals can help with asynchronous work, and having open video channels will help the team pick up from their last session very quickly. Even if you are co-located, transitioning to digital first can help you to avoid taking pictures of whiteboards and transcribing them into Powerpoint or Keynote. One of the problems with decks is that they tend to be static. People use company templates to document ideas after workshops and send them along, and then they are taken as a final version. The magic of a shared digital canvas is that the iterations can be continuous and the frameworks can change after new lessons are incorporated. Anyone can contribute and let others know of the updates to the global team right after the sessions are done, keeping the momentum going. 6. Support rookies with frameworks and experts on demand. If a team is facing a problem, you can take advantage of having the entire project online using common visual frameworks and use of common language. This way, the expert can onboard quickly and digitally so they can get right to the source of the issues and get the team back on track without ever stepping foot on a plane. You should also encourage setting time for remote office hours for growing facilitators to sync with the masters and also have pre-scheduled remote co-facilitation sessions. 7. Open up virtual project rooms and align globally. When all work is digital, colleagues from different teams can peek into the work in progress and get inspired and provide feedback spontaneously. This transparency and openness fosters serendipitous connections, like seen in the famous Building 20 at MIT. You will also be able to show the thought process—how problems were spotted and solutions ideated, to make everybody in the company understand and rally behind that team. 8. Enhance remote collaboration with ongoing education. Complement your design education with digital collaboration education. Some folks might naturally feel comfortable interacting via screens, but others may need to learn how to run a workshop remotely and get the etiquette right. When deploying learning systems, consider tools that combine learning and deliberate practice simultaneously. The digital collaboration tools available today provide a great experience and are affordable at scale, especially compared to the travel and entertainment expenses required for in-person workshops. Plus, the benefits—including less time spent traveling or coordinating schedules and a dramatically shrinking CO2 footprint—have already been embraced by early adopters. We will be showcasing MURAL and a digital project room at the O’Reilly Design Conference to demonstrate digital design thinking collaboration. Stop by and share ideas about how to enable distributed teams to visually collaborate in design and beyond. We’ll bring an 84” Surface Hub and a series of smaller devices to show a live collaboration scenario. Jim Kalbach, head of customer success at MURAL and author of Mapping Experiences, will also lead a digitally powered workshop, where he’ll share more detailed tips. This post is a collaboration between O'Reilly and MURAL. See our statement of editorial independence. Article image: Columbus Circle Globe à Manhattan. (source: PublicDomainPictures.net).